In a corporate environment that deploys hundreds or thousands of SyncBackPro installations on its end-user workstations, administrating their backup profiles can become a tedious and painstaking job for the IT administrator if there is no centralized console to manage them. Thankfully, with SBMS (short for SyncBack Management Service), we can do just that. 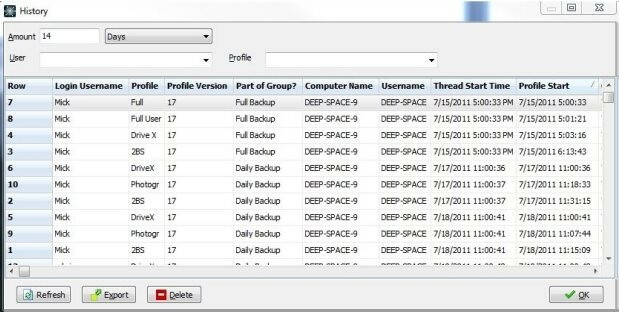 In this article, we will look at what SBMS is and how it can be used to manage remote SyncBackPro profile deployment and monitor run history. Pushing customized profiles to remote SyncBackPro installations on end-user workstations (or servers). Limiting what end-users can do with SyncBackPro (e.g. stopping users from deleting their profiles or changing profile settings, etc). Tracking the status of profile run results and history. SyncBack Management System consists of 2 components – the SBM Service and SBM Console. SBM Service is usually installed on a central location (such as a server) and it stores the database used in the application. The SBM Console connects to a remote SBM Service (over the Internet or an intranet) and allows administrators to centrally manage and monitor the backups performed by SyncBackPro client machines. With SBMS, IT administrators can create managed profiles (or templates) and upload them to the SBM Service. Using the SBM Console, the admin can setup groups and assign users and managed profiles to these groups. 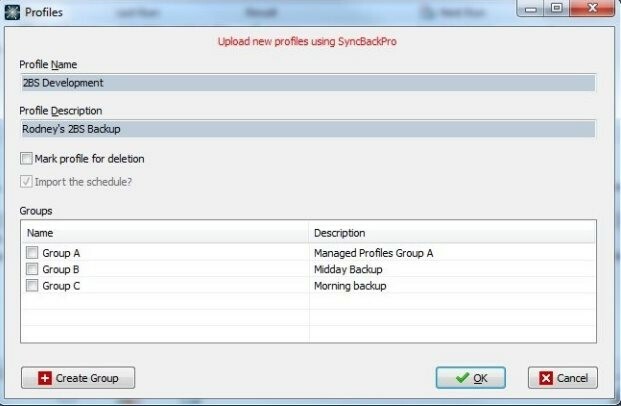 SyncBackPro can then connect to SBM Service, and based on the user account used, the managed profiles assigned to the respective group are downloaded on the remote workstations. As an example, the admin can deploy different profiles based on department (Marketing, Finance, HR, etc), so they back up different sets of data according to their group policy. A security profile can be assigned to each user, which defines what the user can do in SyncBackPro. For example, you may want to limit the user’s ability to configure or delete a profile. Using the SBM Console, administrators can review a history of past profile run results and they can create customizable reports for regular management review. SBMS can specify which workstations can log on to the server by client machine IP address. SyncBack Touch installations can be configured to use a SBM Service for security so that only valid users and installations can use SyncBack Touch. Another useful add-on utility is called the SyncBack Touch, which is a cross-platform service that works with SyncBackPro (and SyncBackSE) to remotely access Windows, macOS, Linux or Android file systems for backup and sync operations. SyncBack Touch can also be configured to work with SBMS. It is especially useful in corporations that runs multiple Windows, macOS, Linux and Android systems and require their data backed up. We have a Knowledge Base article that provices further details. The SBM Service licensing is based on a per-seat basis (for each installation of SyncBackPro). Thus, the number of SBM Service license to purchase shall equate to the number of SyncBackPro license purchased. The SBM Console is free and may be installed on as many administrator computers as required. SBMS costs just US$10 per license and volume discounts are available starting from 5 licenses or more. Visit our web-store today to purchase your SBMS licenses. The SyncBack Management System and Console ship with a useful help file. You can also download a detailed installation guide. As companies grow and staff headcount increases, the IT administrator will find it easier to manage multiple SyncBackPro profiles by using SBMS as their centralized console for backups. The low licensing cost of SBMS means it’s a breeze to integrate it for company wide deployment.